"If you’ve ever wondered what Santa Claus is like after a long night a-wassailing, let me assure you that Carl Brandt Long delivers one of the subtlest and funniest drunk performances I’ve ever seen!" 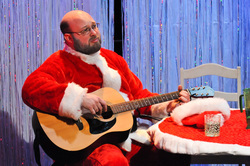 "As Santa, Carl Brandt Long does our holiday hero real justice with good comic timing, great chemistry with the rest of the cast, and nifty guitar and ukulele skills." "Carl Brandt Long and Matthew Ward bring tenderness and a fully developed relationship to the twisted father and simpleton son." "The first, and only, time I’ve ever felt bad for a King dying in Shakespeare was during this performance. Carl Brandt Long as Duncan seemed so genuinely nice and jolly that it seemed like something was wrong with the world to see him leave in such a fashion." "Offering up some comic relief is Long, who literally throws himself into each swinging second of stage time. Playing the drunken Launcelot, his animated performance provides a much needed jolt of enthusiasm and simple silliness." "Carl Brandt Long shows us humanity in the pragmatic and driven Oates, who argues that an injured mate should be left behind." "Mark Smeaton (Carl Brandt Long) is one of the men tortured into testifying against Boleyn. Long is a memorable in his supportive scenes; his expressive face captures the crowd when laughing, crying or trembling in fear. He has a smile that makes another smile and a frown of equal effect." "Carl [Brandt] Long is excellent as the headstrong Tybalt while absolutely chilling as the cruel, demanding Capulet." " Long projects meanness so well he should have his own theme music." "Carl Brandt Long has the heady job of playing the great nosed one (and boy is that a big schnoz). He does so with aplomb and ease. Throughout the mountains of dialogue, Long never misses a step or fails to capture the intended emotion. Specifically, the talented actor encapsulates Bergerac’s defense mechanism of quick wit, which the character uses as a crutch against insensitive snout comments and nostril teasing."